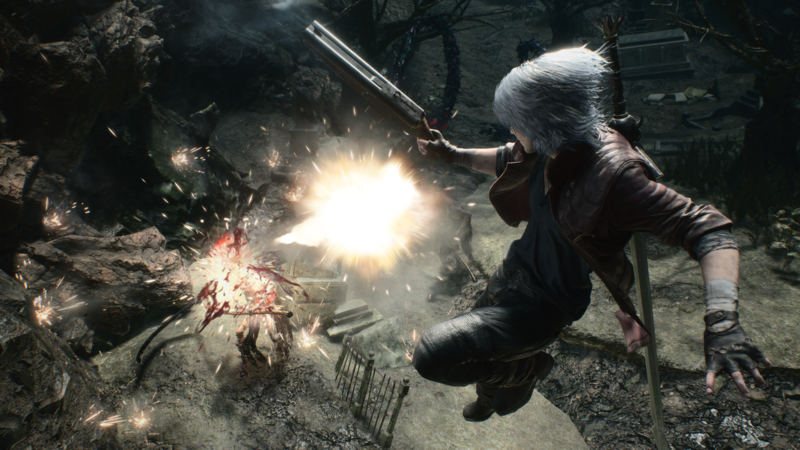 Capcom has released quite a lot of media in preparation for the Devil May Cry 5 presentation at Tokyo Game Show 2018. Capcom is touting that, next to Nero and Dante, there’s also going to be a brand new playable character called V. Okay, we have been aware of the existence of a mysterious third playable character since E3, but the identity and bio were kept under wraps, and this is the first time we’ve seen his face. At this point, we don’t know a lot about the new character, V, aside from the fact that he is quite dashing and seems to prefer speaking in poetic verse only. So yeah, while this is the first time we’ve seen V’s face, and also the first time we saw the DMC 5 versions of Trish and Lady. Dante’s Sparda and Balrog were also revealed during the Tokyo Game Show. The Balrog was described as a Devil Arm. Players get to wield it for close-range fighting and Dante, of course, pulls off a series of cool powerful kicks to mow down all sorts of hideous-looking baddies. Capcom also revealed that players who buy the Deluxe Edition (or if they preorder) will be given access to some delicious in-game goodies. One of the greatest traditions of the DMC series is being able to pull off those awesome hits and combos. DMC 5 is no exception in that regard, so there’s an amazing variety of moves players against armies of foes. We’ve recently seen some of those in action as well. Don’t forget, folks, Devil May Cry 5 is going to hit stores on March 8, 2019 on PlayStation 4, Xbox One, and PC.